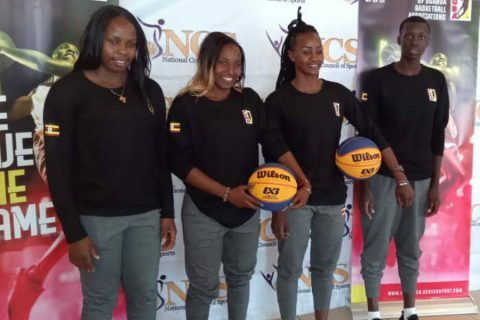 LUGOGO – The Uganda U23 Women’s national team slatted to take part in the FIBA 3*3 World Cup in China was flagged off on Monday afternoon at Lugogo. The team of four will represent the nation at the global showpiece in the Xi’an, China. The World cup which will run from October 3rd to 7th features 20 Nations for both Women and Men. Team Uganda will be represented by Africa’s top ranked 3×3 player Jamila Nansikombi leads Uganda’s team of four. She is joined by JKL Lady Dolphins teammates Hope Akello and Ritah Imanishimwe as well as the youngest player on the team Jane Asinde who plays for Magic Stormers. FUBA President and head of delegation Ambrose Tashobya is grateful to the government for their support. “We are grateful to the Government of Uganda through the National Council of Spots for the support they have offered to our National Team programs. Said Tashobya at the flag off. Uganda is in Group A alongside hosts China, Hungary, Romania and Germany.